I love the details on these. 100% cotton moleskin. Comes in both brown and navy. 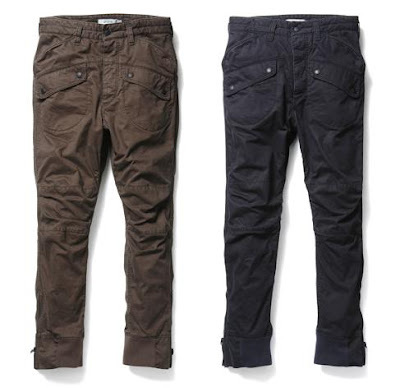 The front cargo pockets are the real highlight of the pants that will set them apart from normal side pocket cargos and regular pants. I think with a blue oxford and a vest or waistcoat these mechanic pants will set your outfit apart from what the rest of the crowd will be wearing this fall. Retail is ￥29,800 which comes out to around $315.00. A little on the expensive side, and probably nearly impossible to get without a Japanese proxy but I'm sure there's got to be more companies making pants like these. Available here.